The LANCOM L-322agn dual Wireless is a powerful 11n WLAN business access point. 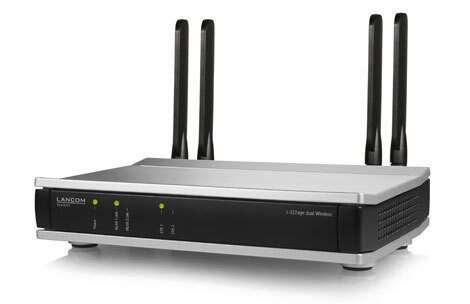 It simultaneously provides 11n clients with professional and reliable WLAN in the 2.4-GHz and 5-GHz band with optimized network load. An ideal combination for professional 300 Mbps WLAN in the business field. The LANCOM L-322agn dual Wireless is a powerful 11n WLAN business access point. It provides 11n clients simultaneously in the 2.4-GHz frequency band and 5-GHz band with 300 Mbps WLAN and optimized load balancy thanks to Band Steering. 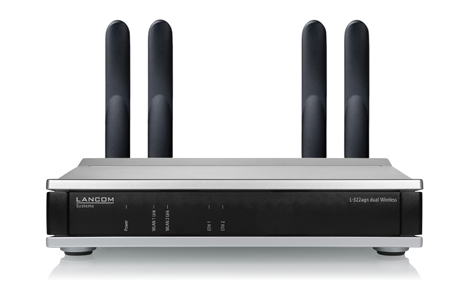 The LANCOM L-322agn dual Wireless supports the WLAN optimization concept LANCOM Active Radio Control. This intelligent combination of innovative features included with the LCOS operating system – such as Band Steering, Adaptive Noise Immunity, RF Optimization, and Client Steering – sustainably increases WLAN performance and supports administrators with professional tools for WLAN management. The LANCOM L-322agn dual Wireless uses Spectral Scan to search the surrounding radio field for sources of interference. This professional tool for efficient WLAN troubleshooting is a combination of hardware and software features. It identifies and graphically represents sources of interference, so helping the administrator to initiate countermeasures. With numerous integrated security features, such as IEEE 802.1X, the LANCOM L-322agn dual Wireless provides optimal security for networks. As a result, employees and visitors all benefit from security policies in the network. By supporting zero-touch deployment, the LANCOM L-322agn dual Wireless is quickly and easily integrated and configured without having to access the configuration UI. In installations operated by a WLAN controller or the LANCOM Management Cloud the access point receives an appropriate configuration immediately after network authentication. In combination with the LANCOM Public Spot Option, the LANCOM L-322agn dual Wireless is ideal for operating hotspots. Users benefits from a hotspot that is secure and easy-to-use, while hotspot operators can be sure that their own network remains separate from the hotspot. LANCOM products are designed for a service life of several years and are equipped with hardware dimensioned for the future. Even reaching back to older product generations, updates to the LANCOM Operating System family are available several times a year, free of charge and offering major features.